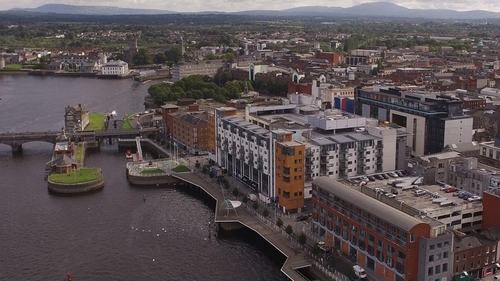 Limerick is experiencing an economic resurgence and the city is seeing record levels of inward investment. There is a confidence around the place, and it is not just because Limerick won the All-Ireland hurling final this year. The framework for this resurgence is the local authority's Limerick 2030 Plan - an economic and spatial plan for the region. The 20-year action plan was published with a top-line target of €1 billion in enterprise and investment infrastructure and 12,000 jobs. Such has been the success of the plan that both these targets have been surpassed five years into it. The chief executive of Limerick 2030, David Conway, said that Limerick did something which is very unique - the city set up a "purpose vehicle" to look at properties to purchase for anchors of economic development and growth as well as residential development. Limerick City Council has purchased five key sites throughout the city - Troy Studios, Gardens International, the Opera site, Mungret College and Cleeves Campus - with this aim in sight. While the 20 year action plan had set ambitious targets, the city is already ahead of some of those targets. David Conway said this was achieved because of the country's economic growth and also because the city is giving companies and businesses a fantastic opportunity outside of the Dublin region. He said that Limerick City Council's Economic Development unit has worked very hard, looked at what companies wanted and then gave them the environment they needed. He also pointed to the fact that Limerick is a great place in which to work, it has good infrastructure, an educated workforce and a good work-life balance. "Limerick is open for business," he stated. Mr Conway said the Limerick plan also ties in nicely with the Government's National Planning Framework 2040, adding that when Dublin grows the regional economies can grow along with it. According to Mr Conway, the Mungret College site is the plan's key residential site where 60 acres of land have been purchased. Limerick City Council wants to help people to buy their first home, or trade up if they need to or retire in the village itself. The site will have the capacity for up to 850 residential units and will be developed on a phased basis. He also said that Troy Studios has been "an unbelievable success story" already and one which showed the vision of Limerick City and County Council in actually buying it. The studio is the former Dell plant and after some work being carried out on the site, a production studio is now in place there while over 400 new jobs have been created there. The first movie from the studios is coming out later this month. Limerick won the All-Ireland hurling final this year for the first time in 45 years and Mr Conway said that such a win is a great boost to the city as it shows very clearly the city's "can do attitude". MORNING BRIEFS - 24 Irish companies will join more than 2,800 exhibitors at the world's largest trade expo in China. The event is expected to attract more than 150,000 purchasers from across China to the National Exhibition and Convention Centre in Shanghai. Trade between Ireland and China was $11 billion in 2017, up nearly 37% on the previous year. *** The annual cost of owning and maintaining a family home has risen for the third successive year, according to analysis from AA Home Insurance. It found the cost of owning and maintaining a home comes to €16,374, up from last year's estimate of just over €16,000. That equates to around 42% of the current average national wage. *** Ryanair has said its passenger numbers grew by 7% in October to 12.6 million. When passenger numbers from the recently launched Laudamotion are included, total passenger numbers rose by 11% to 13.1 million last month. *** Brittany Ferries has said it is seeing fewer bookings for next summer as passengers from the UK hold off due to the uncertainty of Brexit. The ferry operator is concerned it will not be able to fill three new ships with passengers and freight.